Do you have a dish that totally intimidates you, so much that you never try to make it? For me, that was scallops. Maybe I watched too many Gordon Ramsey shows and was secretly waiting for him to burst out of my pantry and scream obscenities at me because I had overcooked or undercooked this little delicacy of the sea. 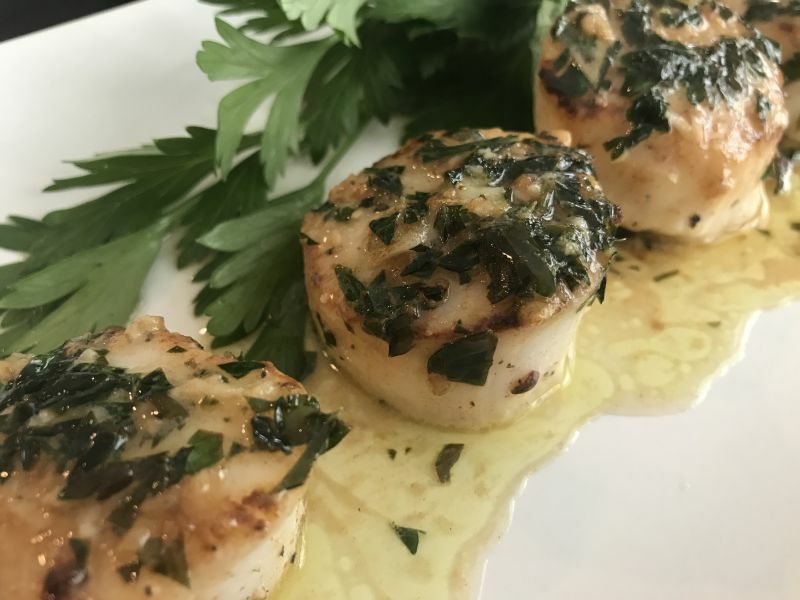 However, mastering this rather expensive shellfish is not so difficult, and today I want to show you how to make an amazing meal of Seared Garlic and Lemon Scallops. Local fish markets to get fresh scallops are best! 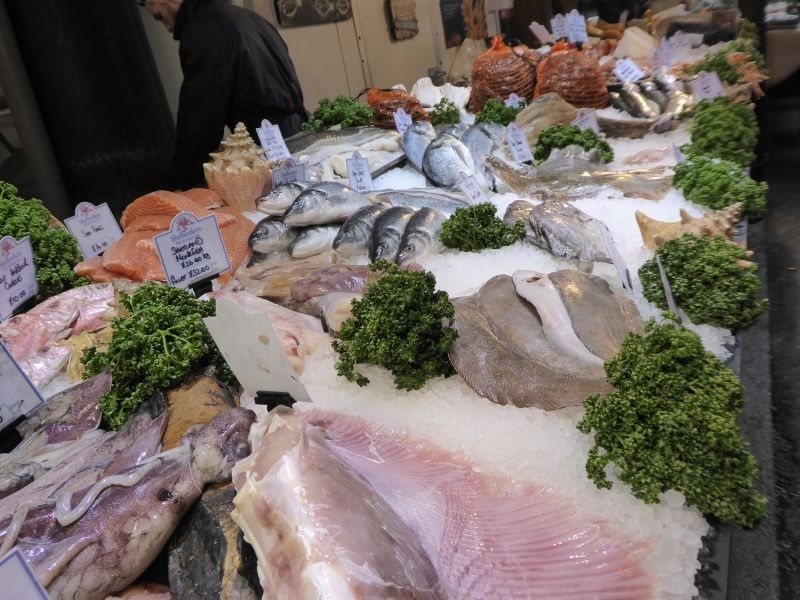 This picture was taken at Old Borough Market in London at one of the stalls selling freshly caught fish. It’s important that you head to your meat market to get fresh scallops. If you have a local seafood market, that is even better. And although scallops are rather expensive by the pound, you are going to purchase them “per person” which keeps the price to a minimum. When I prepare these for guests, I cook 4 per person, and I add 2 in case I ruin one or two by not being careful with my metal tongs. 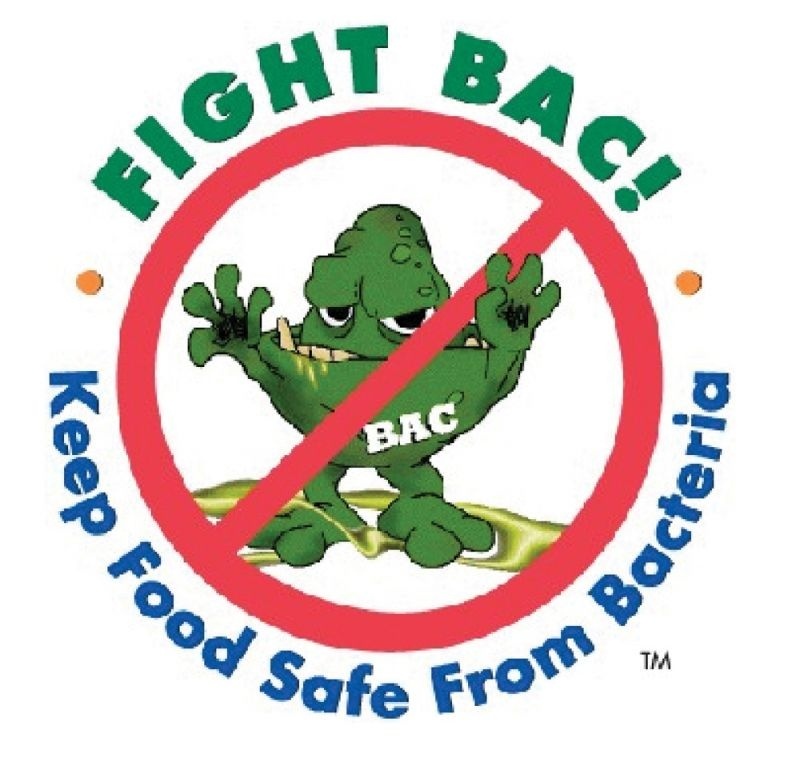 Practice Food Safety with scallops! Amber comments: For safety, you need to use common sense when purchasing scallops and storing them. April’s comment about getting them from a fresh seafood market is due to the fact that whilst some grocery stores sell them, they often get dried out or aren’t sold fast enough to truly be fresh. When you look at them they should be pink and glossy. They should have a nice plump look with no dark edges or dryness. If you are in doubt about their freshness ask the person selling them. Do not buy previously frozen, thawed scallops and put them in the freezer at home – that is asking for problems. 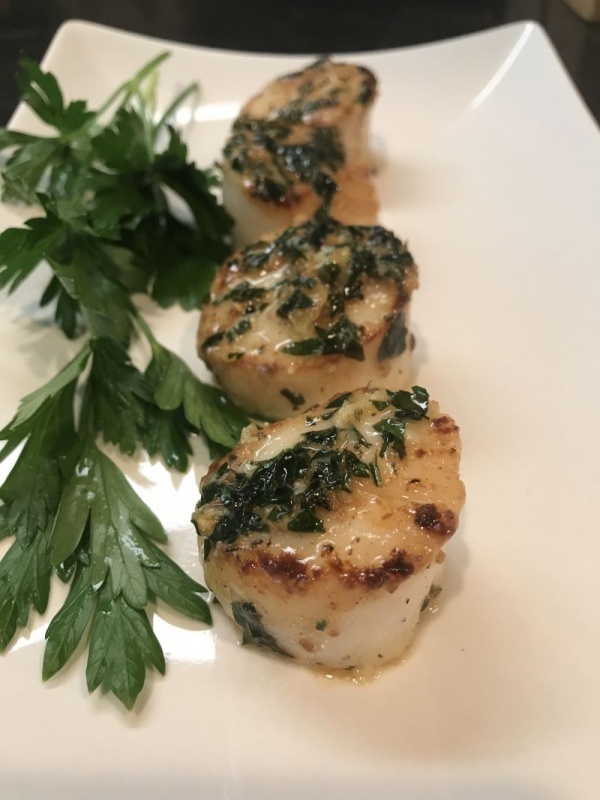 Since making this dish is so quick, we suggest you set the table and prepare your side dishes before you cook the scallops. 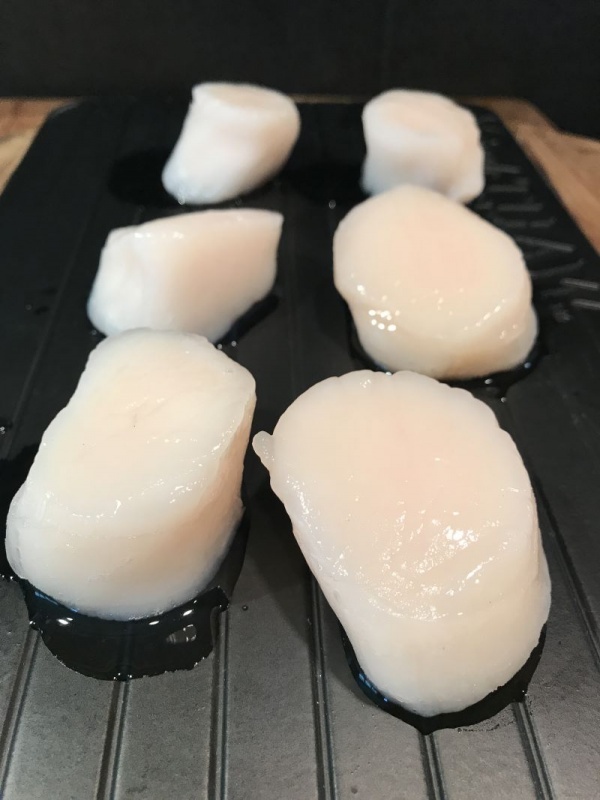 Once you get the scallops home from the market, refrigerate them immediately until it is time to cook them. 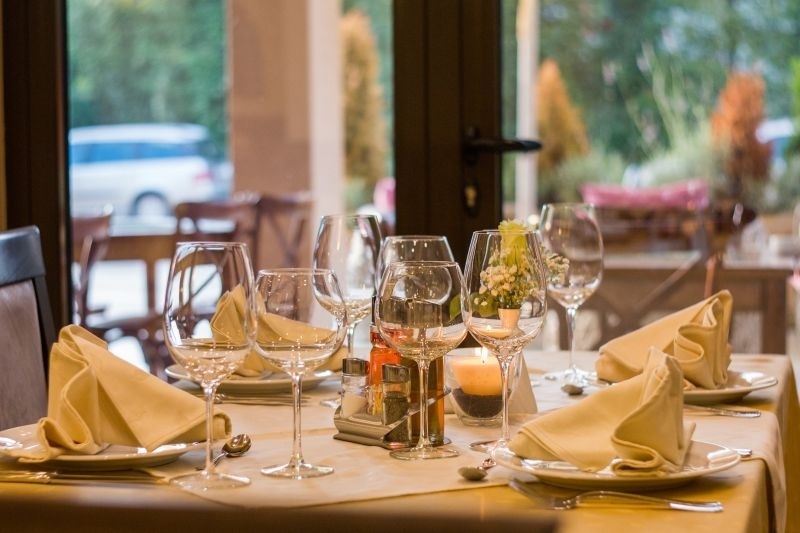 You will find that they prepare quickly, so it is very important that you have the table set, and side-dishes ready. From start to finish, including the preparing of the parsley and garlic, is about 20 minutes. Prepare your ingredients in advance and have the next to the stove in little dishes so you can just grab them and toss them in the pan. 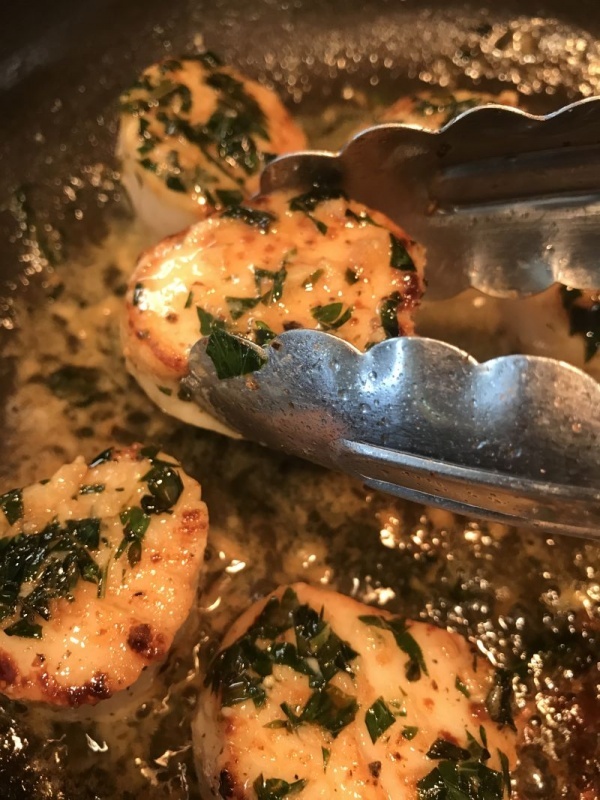 Once you put the scallops in the skillet, you will have less than 10 minutes to meal time! I am doing 2 servings with this recipe, so multiply according to how many people you are serving. Follow our #ProTip for cooking scallops perfectly every time. *Note: Scallops are quite fragile. They tear easily, so handle them gently. When you retrieve them from the refrigerator, rinse them individually and then pat them dry with paper toweling, and set them on a plate or saucer. If the scallops have the little orange colored muscle on the side of them, peel this part off with your fingers as it can be bitter. My butcher cleans these prior to selling them, so just check to see if yours has them or not. Seriously, you can even by frozen scallops, and thaw them for this dish. I promise no one will be able to tell the difference. Season them with sea salt and some fresh ground pepper, and then turn and repeat to the other side. Set them with your prepared ingredients. Use a garlic grater for the best flavor. **In the photographs you will see one of my favorite kitchen tools. I bought it at a home show, and I use it all the time. It is a garlic and parmesan cheese grater. 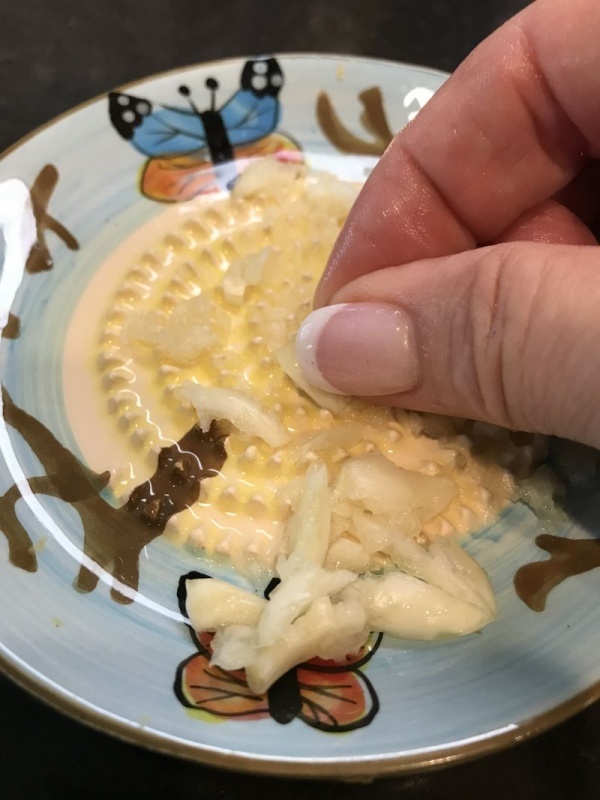 I only use it for garlic, though, as I find it easier than mincing with a knife and it truly brings out so much of the garlic flavor! If you find one, buy it! The pulp of the garlic is simply brushed out of the grates with a little stiff brush that is included in the set. If you want your own, you can order it from Amazon Here. A seared scallop should have a golden brown crust on it. 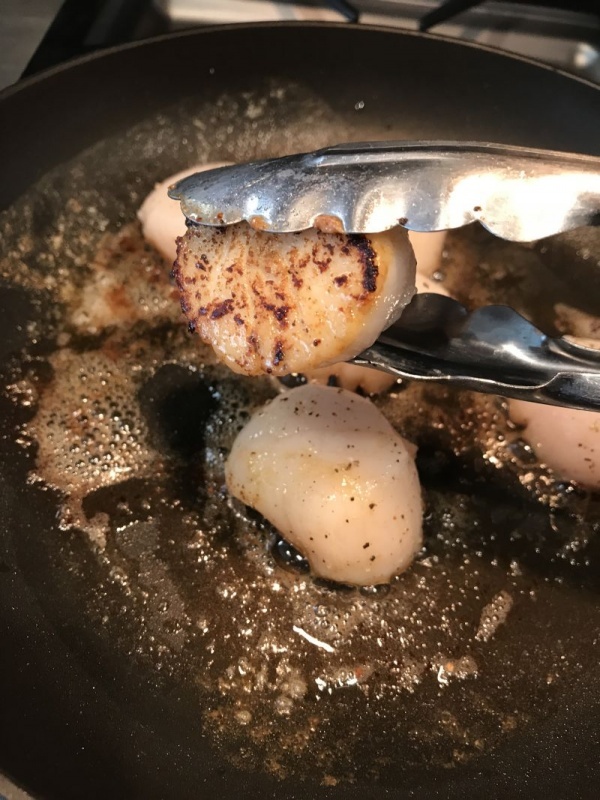 The secret to a great scallop is a good sear. Make sure your skillet is hot and that you don’t touch your scallops while they cook. Let them sit and get that crispy golden color. Scallops and a lovely salad and a crust of French bread make a beautiful meal that is both elegant and satisfying. Personally, I think this combination makes a beautifully romantic dinner, so light a candle or two and turn the lights down low…. If you are going to use scallops from frozen, make sure you thaw them carefully in cool conditions to avoid bacteria. 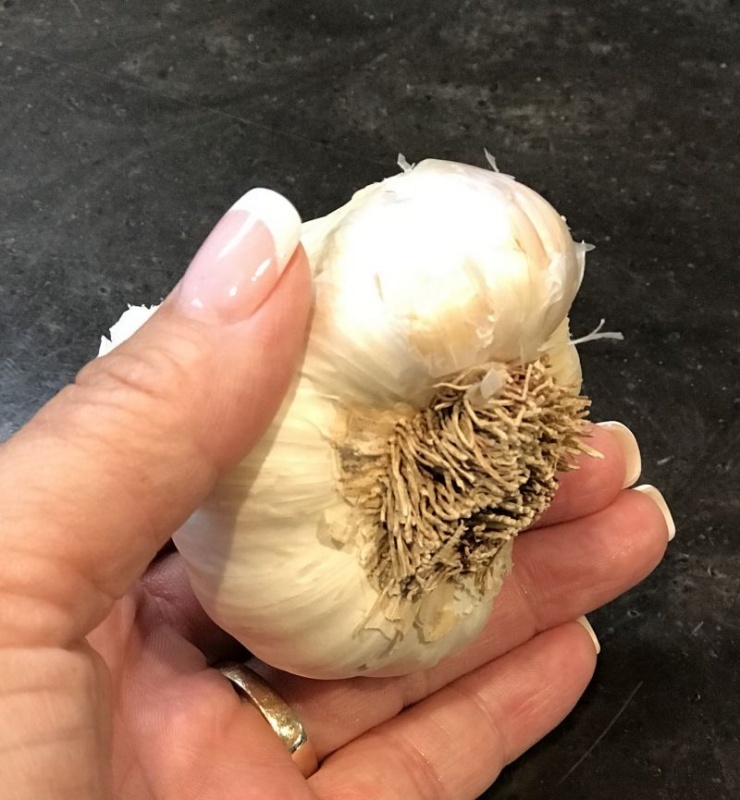 Remember a clove of garlic is only one section of the bulb. Do not use 3 bulbs of garlic! 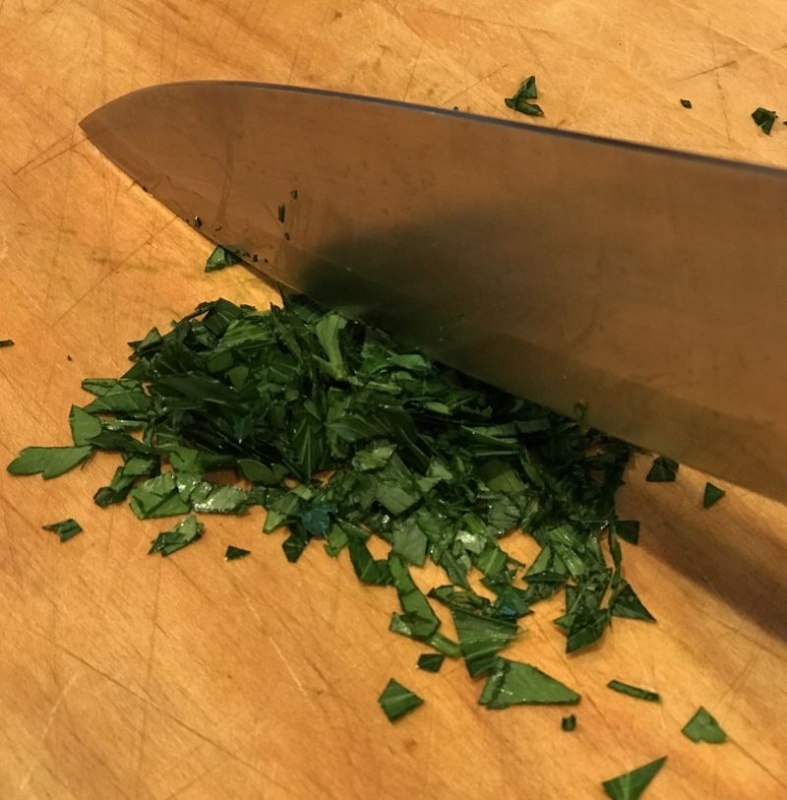 Chop the parsley leaves with no stems. 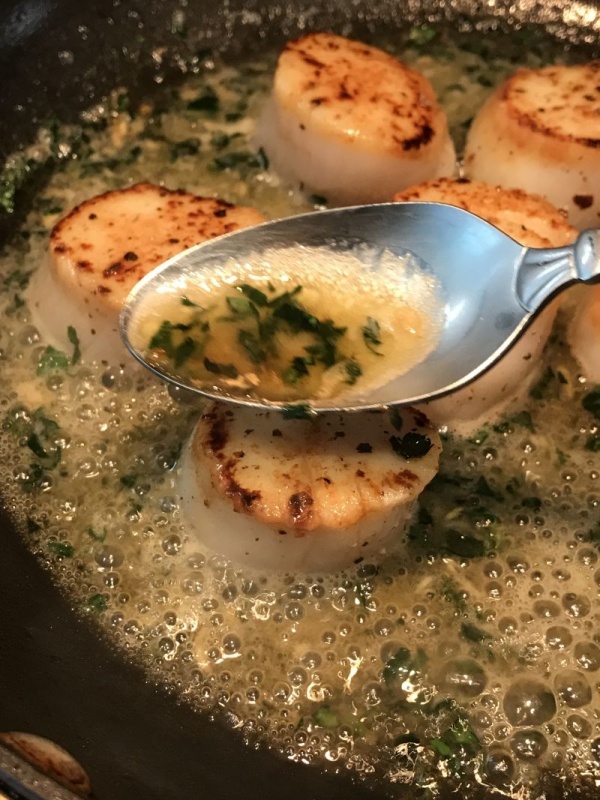 Gather your prepared ingredients to make your scallops and keep them handy so you don’t have to stop what you are doing in the middle of cooking. Prepared scallops with salt and pepper before cooking. 1. Prepare scallops by rinsing with fresh cold water, and patting dry with paper toweling. 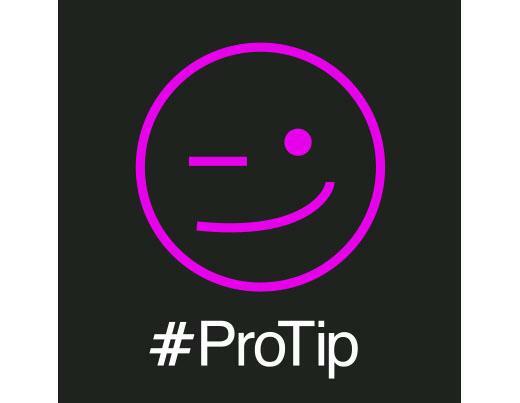 Place on a plate or saucer and lightly salt and pepper, then gently turn them over and repeat on the other side. Make sure your pan is hot so you get a good sear on the scallops. 2. Melt 1 TBSP of butter in a skillet. When the butter starts to bubble, place the scallops gently in the pan, flat side down. Handle with tongs, but be very careful as they tear easily. Cook for 3 minutes so they get a beautiful caramel brown color. Do not keep checking them. Leave them alone so they can brown properly. It’s very important that you allow them to sear in the hot skillet without moving them. 3. Remove from the skillet and place on a plate or saucer. 4. Add the additional butter, garlic, and parsley and stir gently to cook and meld the flavors. 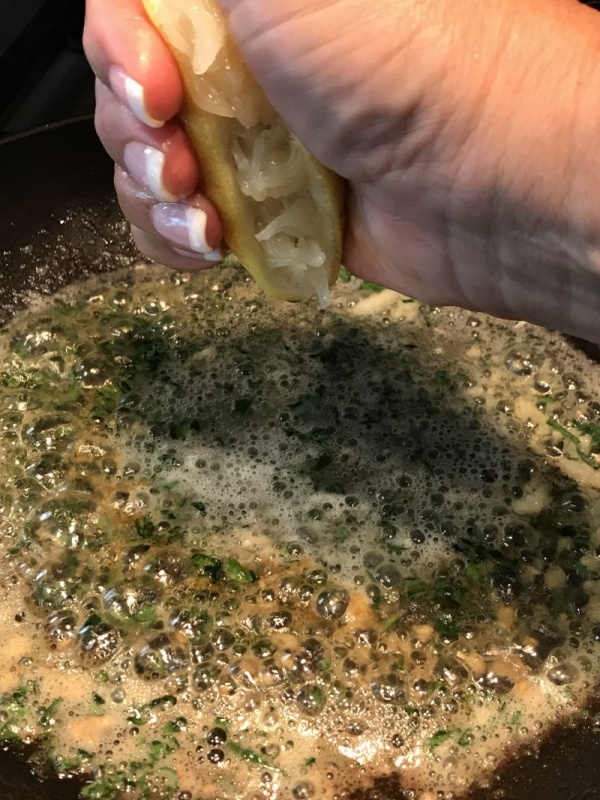 Squeeze lemon into the butter mixture for that extra pop of flavor. 5. Squeeze 1/2 of the lemon into the skillet and stir. 6. Add a large splash of white wine (about 1/4 cup) and stir to deglaze the skillet. Return to a good sizzle. Spoon the sauce over the scallops as they finish cooking. 7. Return the scallops to the skillet, brown side up, and continue to cook for another 3 minutes. Tip the skillet to the side a bit to pool the sauce in the corner of the skillet. Use a spoon to scoop up the sauce and baste each of the scallops repeatedly as they cook. Your scallops should be an opaque white on the sides and firm to the touch, yet still a little bouncy. Be careful when turning the scallops or removing them from the pan as they tear easily. 8. 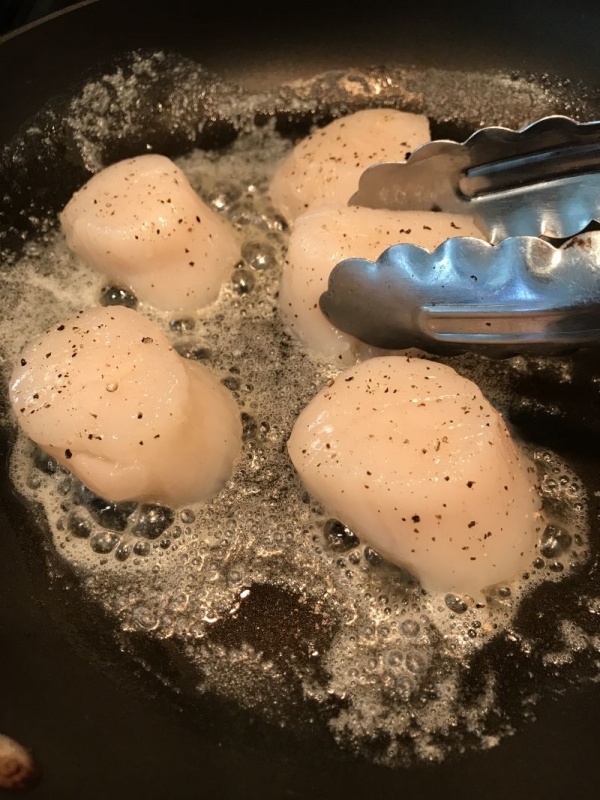 Turn the skillet off, and gently place the scallops on prepared plates or a serving dish, being careful to not tear them with the tongs. Garnish with a parsley sprig. Look at the sauce just dripping down the sweet scallops. Yum! You are going to feel like a gourmet cook with this recipe! Try it once for yourself before you cook for guests, so boost your confidence! The buttery texture of the scallops is heavenly, and you will find yourself dipping your crust of bread in the sauce as well. 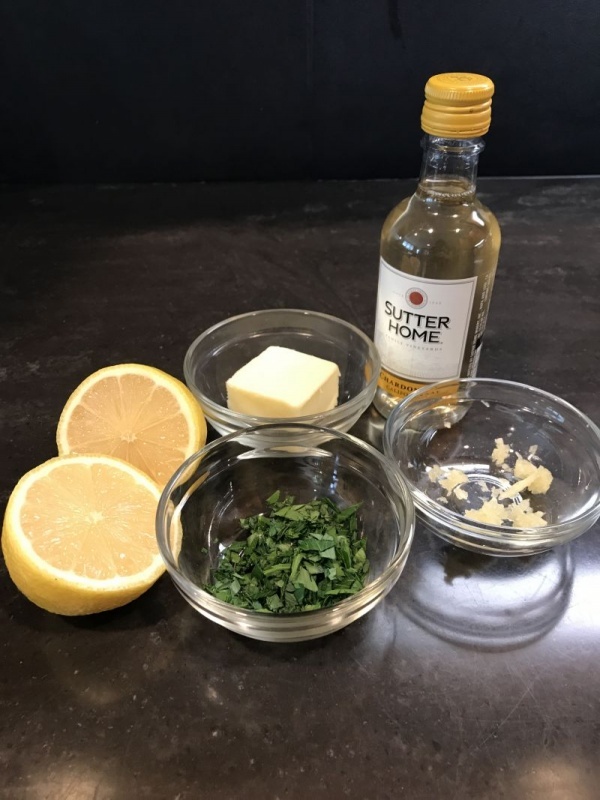 If you enjoyed reading this post, check out some of our other seafood recipes – like this recipe for Maryland Crab Cakes . We post a new recipe every Thursday. 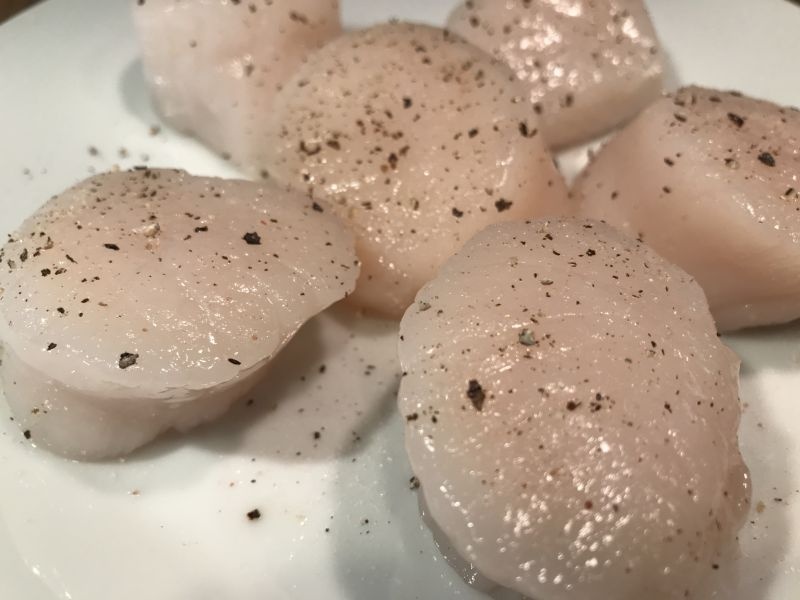 Everyone needs a fool-proof scallop recipe and this one is perfect – simple ingredients and step-by-step instructions are the keys. Thanks for another delicious dish, April! Thank you for your kind comments Lauren! I don’t eat scallops but they do look good! I will have to come up with a special recipe just for you!